This was a very bland mall cinema, which was located in the mall of the same name. It opened by General Cinemas in early-1966. Village Theatres later operated this place, probably beginning around the same time as the nearby Lakehurst Theatre. Although it looks like new seating had been installed, it was closed by Village in 2003. A fate that has befallen many cinemas owned by Village! Going to the movies 1974 style! Not to do over any one but as the theater listing states at the time this theater opened at a 2 screen General Cinema and was later split to a 4 at some point likely in the late 80s. Pemberton Square Cinema 4 was another victim of Village Entertainment. It has been closed now for nearly seven months; it was shut down with the feud over high rent issues with CBL Associattes and Vicksburg has now regressed back another 100 years becouse of this feud. Yet the real hard question that hasn’t been addressed is this: why didn’t this market get a box cinema outside the mall? Now Regel Entertainment Group formally rented that cinema before they sold it to Village Entertainmetn in ‘04. Film wise I can tell Village didn’t do know better. They didn’t do a market study to improve things. Like ask the questions what the customer wanted. Like Regel they continued to target niche market of getting the blacks and teenagers. They never looked at the fact that they lost the teen market to the Jackson Metro area. Especially with Cinemark TinselTown in Pearl,the Malco in Madison and Flowood 15. Poor marketing can also be attributed to its downfall. And now the mall cinema is closed property at the decaying Pemberton Mall. Here is a photo of this place. The movie poster in the photo is of SCARY MOVIE 2, so the place was open until at least 2001. Background: Pemberton Cimema 4. Four screen multiplex built sometime in the late'80s. Didn’t come operational unitl the early ‘90s. First owner Regel Entertainment Group under the flag title of United Artist Theatres. Now the Clinton 14 another Regal Entertaintment Property flys that same name. As does the Flowood Cinama 15. Now Regel didn’t go out of the mall in the late '90s nore during the early part of this decade. Regel sold the Pemberton Cinema to Village Theatres in either 2003 or 04. But for sometime under mismanagement audiences moviegoing declined. Market shifted to the TinselTown in Pearl,Malco17 in Madison;Clinton 14 out of Clinton Ms which is thirty miles from Vicksburg. Management under both Regel and VillageTheatres didn’t pay attention to the fact that market had shifted to high end cinemas in the Jackson Metro area. Now why would Regel Entertainment sale one of thier properties to a bad operator like VillageTheatres? Is this cinema still here? I rember take my 2 year old spn to see the lion King here. 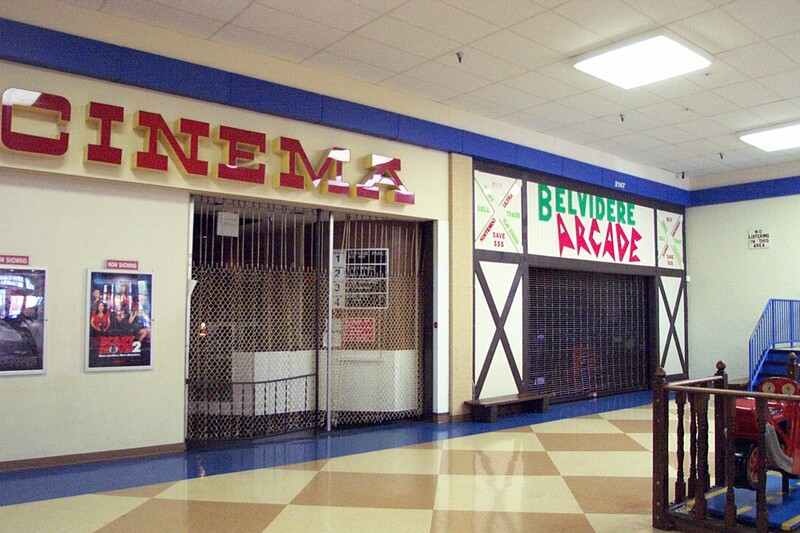 Belvidere Mall, where this theater is/was located, opened in the mid 60’s. (Montgomery Ward was the big anchor store!) I remember going to see movies there a number of times with friends. Belvidere Mall opened in 1965, with General Cinema adding the original twin theater in early-1966. It was made into a discount quad sometime after GCC sold it in September 1988. The last movie shown here was “X2 – Xmen United” in 2003, when it was mothballed. The shuttered theater will be opened up and used for a photography exhibit in a few weeks as part of the mall’s art walk. We’ll mostly be showing work from abandoned buildings, with an expanded feature on movie theaters. Another show is planned for either June or August.